In 1989, the 114th Maine Legislature passed laws mandating the Board of Trustees of the Maine Criminal Justice Academy to establish standards for pre-service training. The purpose of this mandate was to ensure that no person could “serve as a law enforcement officer with the power to make arrests or the authority to carry a firearm until certified as satisfying pre-service training requirements.” This resulted in the first Law Enforcement Officer Pre-Service Training Program. In 2009 the Board of Trustees of the Maine Criminal Justice Academy proposed changes to the current Law Enforcement Pre-Service Training Program. Updates to the existing program were implemented, and the format and number of hours required to graduate was increased. Students will also have to completea supervisory component. Phase I: Students must meet the age and education requirements to apply for this course (see application). Students must complete the 40-Hour On-line Law Enforcement Pre-Service Training Program. Students must complete the MCJA application for the MCJA LEPS Phase I and send it along with the $250 fee, cash or check made payable to Treasurer, State of Maine to the Maine Criminal Justice Academy at 15 Oak Grove Road, Vassalboro, Maine 04989. Students will be given a Log-In and Password to complete the training. This training must be completed before attending Phase II and there is no time limit to complete the Phase I of the training, however at the completion of the Phase I training the student will need to contact MCJA and take a final exam in Vassalboro. From the Phase I completion date, the student will have two years to start Phase II. Phase II: Students must complete the 80-Hour Interactive, Scenario Based Classroom Program. Prior to the start of Phase II, students must complete the MCJA application for the MCJA LEPS Phase II. All students must meet the prerequisites listed below and send to the Academy all the required paperwork described below. Age: Students must be 21 years old, or 20 years old with at least 60 credits from an accredited college, or age 19, currently enrolled in an accredited post secondary education program, with at least 40 credit hours. *Note Copies of transcripts or current grade reports are required with the application for those under 21. Background Sponsorship: Students must have a MCJA Background Investigation form signed and notorized by a Police Chief, Sheriff or Law Enforcement Administrator from a full-time Maine law enforcement agency that indicates no disqualifying conduct or conviction. See MCJA Background form. Disqualifying conduct or convictions will exclude applicants from eligibility, unless given a waiver from the MCJA Board. ALERT Test: Students must have a minimum passing score. The test is given at the MCJA campus the first and third Wednesday of each month at 8:00 a.m. It is also available off-site in the southern area of the state. Call MCJA at: 877-8000, or 877-8020 to schedule an appointment. A fee and photo ID are required. The ALERT test is a reading comprehension and writing skills test based upon the level required to master the MCJA Basic School Curriculum. There is no time frame to pass the ALERT exam prior to the start date of the Phase II program. Physical Fitness Test: Students must pass a Board approved fitness test at the 40th percentile based on age and gender norms. A fee is required. 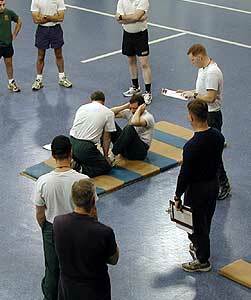 The following three (3) test items constitute the physical fitness test (PFT) requirements for acceptance into the Law Enforcement Pre-Service Phase II Program (same as entry into the BLETP): One Minute Maximum Push-Up test; One Minute Sit-Up test; and 1.5 mile run. The student will be required to pass the PFT exam within 1 year prior to the start date of the Phase II program. Written Test: Students will be required to pass a written test over the Phase I on-line training curriculum before being accepted into the Phase II program. You will need to call 207-877-8000 to schedule your final exam which will take place at MCJA. Medical Test: Students must have a medical physical by an authorized medical person. This medical person must fill out the approved MCJA Medical form. The student will be required to pass the medical physical exam within 1 year prior to the start date of the Phase II program. Phase III: After being hired by a Law Enforcement Agency as a Law Enforcement Officer, a provisional certificate will be issued upon receipt of a MCJA Notice of Employment and a MCJA Firearms Proficiency Form signed by a Certified MCJA Firearms Instructor. The employing agency must provide 80-hours of documented supervision before certification as a Law Enforcement Officer is granted by the Criminal Justice Academy. The Chief Law Enforcement Officer will have to sign a notarized MCJA Form stating the officer has completed the 80 hours of supervision to his or her satisfaction. The part-time law enforcement officer will have one year to complete the 80 hours of supervision. An officer may receive an extension by the MCJA Board in extenuating circumstances. Phase 1 can be done online at any time and is now available. Complete the Phase I application and send it to the academy with payment and include your college transcript if required. This list is updated as courses become available. Our yearly calendar is completed in June for MCJA courses and dates will be added once the courses are scheduled. Please DO NOT send payment with your Phase II application; wait until you are accepted into the class. Students will be responsible for the following: Title 17A (Maine Criminal Law) & 29A (Maine Traffic Law) are required and may be purchased through your college book store or directly through Swan Island Press, email swanislandpress@gmail.com. For purposes of this class you may use older versions of these books. Per Maine State Statute Title 25: 2804-G Qualifications: An applicant must be 21 years of age or older to qualify for a position as a law enforcement officer unless the applicant has an associate's degree or 60 credit hours of postsecondary education, in which case the applicant must be at least 20 years of age. This course is offered to applicants 19 years of age that qualify for the program as a courtesy to Colleges and Universities that offer course credits for this program. If you have further questions about the Pre-Service, contact Don Finnegan at the Academy.